Relax and Indulge in the SevernSins! On the banks of the great Severn River, in amongst an Aussie bush setting. Severndipity is perfectly situated surrounded by wineries, restaurants & National Parks. Take time out… breathe in the country air, enjoy good wine in front of the fire, forget about life for a while. 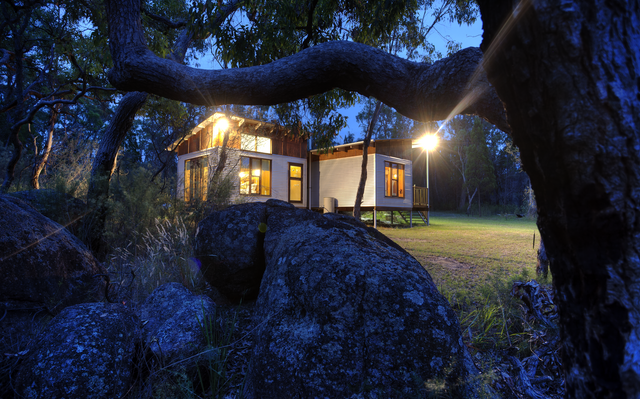 Take a break and explore our beautiful cabins…. Open plan interior perfect for 2 couples, 2 spacious bedrooms, 2 bathrooms, wood-fire, self contained kitchen, carport, sauna, wheel-chair accessibility, Dowmus composting toilet and Barbeque in a Secluded bush retreat. Read more. Open plan interior perfect for 3 couples, 3 spacious bedrooms, 2 bathrooms, wood-fire, fully contained kitchen and barbeque in a rural farm setting. Read more. You deserve a break! Contact us here!